Following historic extreme weather in Florida and Nebraska, the U.S. Air Force is asking for $5 billion to repair two major bases in each state, reports Defense One. Details: Officials said they will have to cut projects at the Offutt Air Base in Nebraska and Tyndall Air Force Base in Florida if they don't receive $1.2 billion for repairs by June, which could affect 18,000 pilot training hours. Background: Offutt Air Force Base, a strategic command center in Nebraska, is essentially submerged after melting snow and heavy rain caused historic flooding. Hurricane Michael hit Florida in early October 2018. 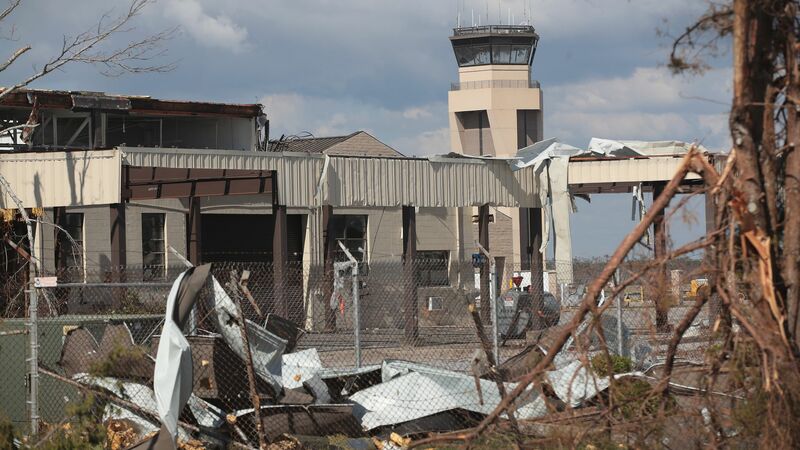 The storm devastated the Tyndall Air Force Base, one of the largest F-22 bases in the country, and damaged numerous aircrafts. Our thought bubble, per Axios Science Editor Andrew Freedman: The military has long viewed climate change as a national security threat, both at home and abroad. Now it's becoming clear that, through extreme weather events, climate change is already damaging military readiness and costing the Defense Department billions, as both Hurricane Michael and the spring floods have ties to a warming planet.